Right Hon E.T. Joshua and the airport is named after him. Thanks to Mr Quow for submitting these photos. 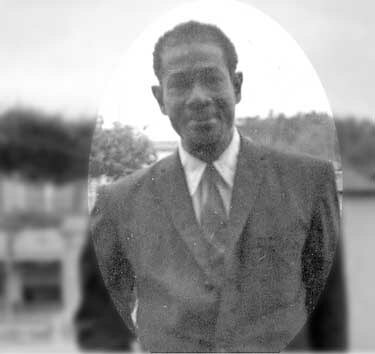 Ebenezer Joshua was born in St. Vincent on May 23, 1908. While working in Trinidad, Joshua had learned much from the militant Trade Unionism of Butler. His direct involvement gave him the experience which came in handy in the UWPRU and his Federated Industrial and Agricultural Workers Union (FAWU). His union activities were concentrated mainly on winning benefits from the plantocracy and in particular, from the so-called sugar barons at Mt. Bentick. Ebenezer Joshua entered parliament with the victory of the eight army of Liberation in 1951 General Elections. His parliamentary role ended in 1979 when he lost his seat in the elections of that year. 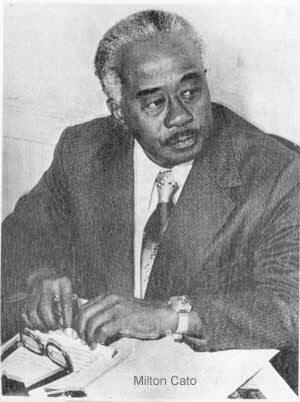 Joshua supported the formation of the West Indies Federation of 1958. There is no doubt that Ebenezer Theodore Joshua was a fighter, a fighter against colonialism, against the anti-working class practices of the plantocracy; fighter for the rights of workers and for the working improvements in the working and living conditions of people of the poor and down trodden. Ebenezer Joshua will long be remembered as the most fiery enemy of the British colonialism and the planter class; as the man who stirred the poor and under-privileged people of St. Vincent and Grenadines into action for the rights of workers and citizens; as the man who struggled to ensure that basic physical infrastructure was put in place for the advancement of our people. The death of Milton Cato has caused some soul searching in our small community. There has been charges of hypocrisy and insinuations about crocodile tears. SEARCHLIGHT has nothing to fear on this score. Long before his death, this paper has been drawing attention to Mr. Cato's virtues, on the ground that there was little point in waiting until a man is dead to bring laurels to his grave. The strength of Mr. Cato's leadership lay in his courage, integrity, humility, oratorical skills and his concern for other people. As others have pointed out, Mr. Cato entered politics in 1955, but did not succeed in forming a government until 1967, twelve years later. They say that a week is a long time in politics. Twelve years in a political wilderness must therefore have been a hell of a long time, requiring the stamina of a Moses to survive. Mr. Cato had it. Other fell by the wayside. He lasted the course. In spite of, or perhaps because of, its small size, St. Vincent is not easy to govern, but Milton Cato had the guts to do the job, whether in raising taxes, coping with volcanic eruptions or dealing with strikes and demonstrations by teachers and others. Mr. Cato was not the sort of man one approached with shady deals. If he liked you, he would pretend not to hear what you had said, causing you to repeat yourself until it leapt to mind that you should not have raised the matter in the first place. If you were no friend, you would get even shorter shrift. The man's integrity extended to even minor matters. Ministers when they go abroad have money advanced to them for expenses and they must account for it on return. Some ministers would simply write that the money has been spent for the purpose for which it was advanced. Not Mr. Cato. He rendered his account in meticulous detail. In like manner, when his house at Villa was being constructed, he instructed that no Public Works vehicle should be seen anywhere near the site. Fish rots from the head down. It was therefore, he felt, incumbent on him to set the example. Milton Cato was not without his touch of arrogance, but one can hardly survive as a political leader without this. Moreover, he knew when to be humble. He did not believe he knew everything and rarely arrogated plenipotentiary powers to himself. His approach to government was that of the trained lawyer he was. He would identify and consult experts whom he could trust. This minimized the number of blunders he made while in office. When St. Lucia's Nobel-prize winning economist, the late Sir Arthur Lewis visited, some of the doubting Thomasses expressed their reservations about the reclamation of the foreshore then taking place. Sir Arthur pointed out that Kingstown needed room to expand, and with inflation, the cost would soon dwindle into insignificance. And so it has happened. The doubters did not know that Mr. Cato had previously discussed the matter with Sir Arthur. Similarly, when he wished to impose new taxes on Mustique, he first discussed it with Attorney-General Warner. The AG quickly disposed of the owner's objections by pointing out that no etcetera clause in any agreement can abrogate a sovereign government's right to tax. AG Warner, a gentleman of the old school, subsequently became an appeal court judge in Trinidad. Once he had briefed himself on a topic, few could present it with greater eloquence. It was at a Heads of Government conference in Trinidad that he made the speech that virtually ensured he got the funds to re-establish the sugar industry.Like most successful West Indian politicians, Mr. Cato appreciated the charms of the ladies, but he could also be loyal to his male friends. He once invited Hally Dougan to advise him as a friend not to hire a certain gentleman for DEVCO, since he thought that the man was a liar. Dougan did not hire the man, but the PSC took him into the Civil Service, only to subsequently discover that his qualifications were fraudulent. Mr. Cato's concern was, however, not merely for particular individuals, but also for the community as a whole. He literally tried to modernize the entire economy so that everyone could have a higher standard of living. One cannot develop an economy without funds, and so he set out to mobilize resources through bond and share issues, as well as through the NIS and NCB. His reputation for competence and incorruptibility was such that it helped to attract a lot of foreign aid. With the help of the Guyanese and Trinidadians, he came within a whisker of having the CDB located here. Indeed but for Edward Seaga it would have been. Finance alone is not enough to guarantee development, entrepreneurs are needed and so Mr. Cato set up the Development Corporation and the Industrial Estate to foster their development. Trained people are also required and so he built many secondary schools, as well as the Teachers Technical College and Teachers Training College. He sent people abroad for training in everything, from medicine to vegetable packing. Physical infrastructure is as important as social infrastructure, and so he reinstated the main roads, built new feeder roads, got Cable and Wireless to modernize the telephone system, nationalized and expanded the electricity service, lit the airport and setup the Water Authority. Small farmers cannot prosper without proper marketing channels, and so he lavished resources on the Marketing Corporation. Anxious that his programs should reach the people directly, his administrations undertook numerous housing schemes.Now that times have changed, value systems have changed and aid policies have changed, we shall not see the likes of Milton Cato for many a year.